Don’t let a space-challenged room make you fold on your design dreams! 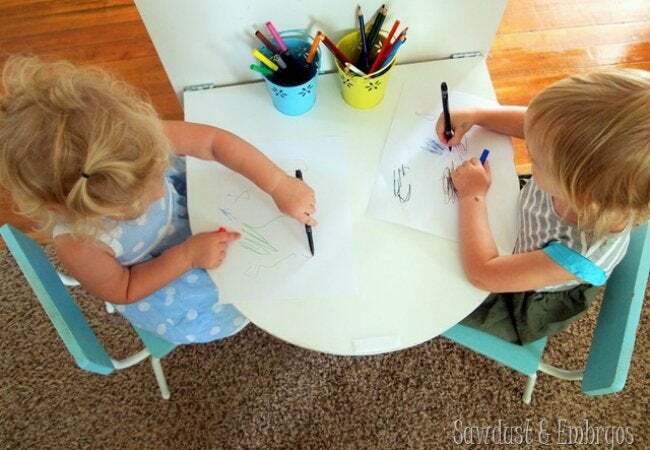 Get the extra work or dining space without sacrificing a single square foot when you build one of these DIY folding tables. Folding tables are an elegant, economical, and effortless way to switch between an extra work surface and freed-up floor space at a moment’s notice. And while they require few materials to build (or makeover), the design options for these collapsible counters are so endless that would-be woodworkers may not know where to begin on their DIY journeys. Fortunately for you, we’ve hand-picked five fantastic folding tables that can be completed in a weekend and then displayed year-round. Read on for space-smart inspiration. Even hosts-with-the-most start their entertaining legacies with little more to wine and dine their guests than scrap metal and a dream. 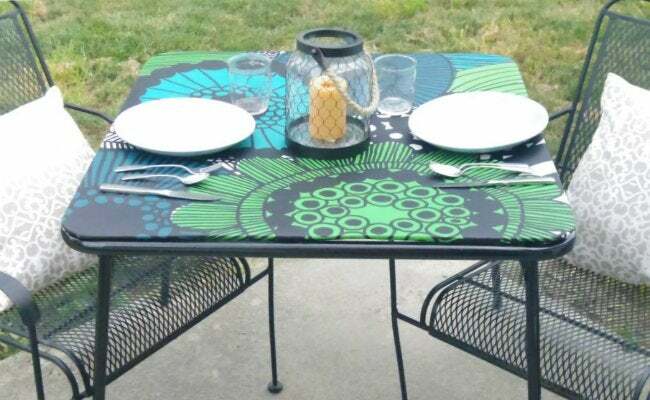 Take the enterprising entertainer at Addison Meadows Lane: She transformed a lackluster card table into an inviting, fabric-covered fold-away by first stripping the old batting and spraying the table with primer and paint. After stapling an attractive (and durable!) PVC fabric to the top, you’re left with a stylish surface for all occasions. 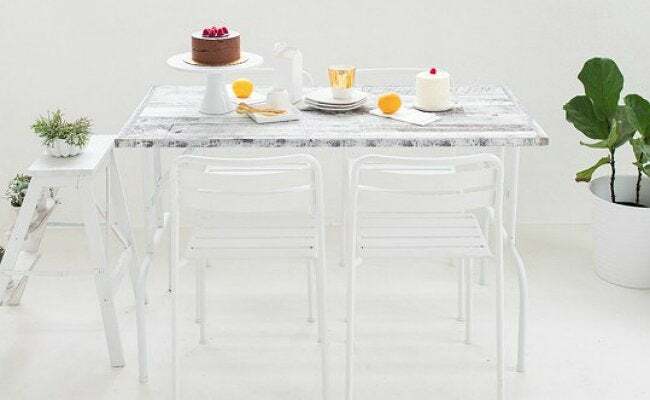 This high-art Murphy folding table from Sawdust & Embryos will make you long for a seat at the kiddie table. The mother and maker behind this craft cove for children started by cutting out a half circle of melamine, reinforcing it with plywood, and then adorning it with piano hinges. After affixing the slab to the wall with Scotch indoor fasteners, press it in place and pull down the table like a Murphy bed to initiate playtime, snack-time, and giggles galore. Leave guests at your next dinner party floored when you tell them the secret behind your latest DIY—that your farmhouse-style kitchen table started with salvaged floorboards. That’s how the crafty blogger at Man Made DIY achieved his own truly distressed look, anyway. The wood planks were glued together and cut to size, with a fashion-forward table skirt affixed along the edges using a pocket-hole jig. Skip a stationary base, though, and screw on spun legs with gate hinges so that you can fold them up after your function. If planning fall festivities has left you with little headspace or floor space, don’t stress. You can marry the function of pop-up furniture to accommodate your extra guests with a style fit for your kitchen. 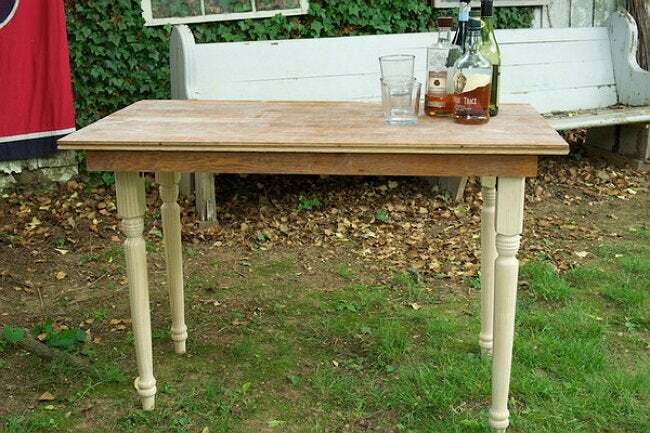 The DIYer behind Sugar and Cloth made this reclaimed wooden wonder by screwing standard folding table legs to plywood, and spray painting everything white. A layer of Stikwood, a peel-and-stick wood planking, over the tabletop creates rustic-modern finish that can weather the whole holiday season without a table runner. Just as you can’t fit a square peg into a round hole, you can’t squeeze a large dining table into a long, narrow kitchen—at least, not if you still need to reach the furthest pantry doors. So to make an eat-in out of an already tiny kitchen, the DIYer at LJDécor converted a slim standing table into one that folds down. 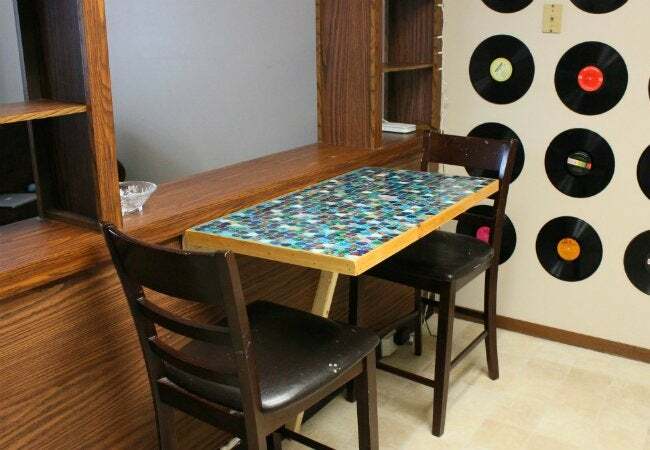 Once legs were removed, the remaining tabletop was brightened and tiled guitar chips, then mounted to the wall with two wood planks and a piano hinge. During the day, the art installation hangs flat against the wall, but come dinnertime, a single angular-cut 2×4 plank slid underneath gives the table a leg up.